With the movie Super 8 creating such a renewed interest in filmmaking, this summer could be a landmark year for inspiring future filmmakers. It's especially possible given the studio behind Super 8 has been hosting a Super 8 iPhone App video contest. While the contest ends June 17, interest might not be confined to a short-lived competition. J.J. Abrams himself started a filming career with a Super 8 camera back in the 1970s. Spielberg did too, and both of them have said most of their friends had thought it was uncool. Fortunately, times change. The grand prize is a Sony DCR-SX85 Handycam camcorder (except it's black). The Sony Handycam was primarily chosen because it represents today's version of the Super 8, minus its vintage coolness and Mac compatibility. The Sony Handycam is a workhorse despite setbacks. As a camcorder ultra-compact entrant, the Sony Handyman works well enough. It can capture 12 hours of footage. It also includes many popular Sony technologies, including SteadyShot image stabilization and a Carl Zeiss Vario-Tessar lens. Although the Handycam works as a still camera, most camcorders aren't suited for high resolution photos. This one included. As an alternative, consider the harder-to-find Sony Water-Proof LCD DV camera. It captures images at 1080p HD and makes poolside and boating films without giving up HD quality. While I wouldn't recommend the cameras for dives, it does justify some image quality loss in favor of ruggedness. The camera is powered by a lithium battery and features 4x zoom. Like many camcorders, it supports 30 frames per second as well as 60 frames per second when set to WVGA. Connectivity is supported by a USB cord and other formats (all cords included). Smart phones change the way starter movies are made. Since Apple upgraded iPhone 4 video technology, the need for carrying around a second camcorder is significantly diminished. The iPhone 4, for example, features 720p HD video recording, capturing up to 30 frames per second with audio. But what really brings back some of the magic of filmmaking are the video apps that add a vintage feel much like camera apps helped recapture Polaroid photography. Two apps are especially suited to this purpose, Super 8 and the 8 MM Vintage Camera. The new Super 8 iPhone App does its best to recapture the functionality of a Super 8 camera, along with the look of the finished work. While the interface styling brings some of the magic to life, one of the best thought out features is a horizontal frame while holding the phone up vertically. Not only does this simple effect make filming more comfortable, it also eliminates a common problem for smartphone films: the thumb spilling into the upper corner. Other features, while fun, are a bit more cumbersome. The Super 8 app makes you go through the motions of "ejecting a cartridge" and "developing" the film. It also doesn't automatically share to your film files. The better features are those that work more intuitively, like the choice of seven lens styles, including Chromatic. While seven doesn't beat the original 8MM Vintage Camera app, it seems to be just enough. The original 8MM Vintage Camera by Nexvio includes a 1920, 70S, Sakura, XPro, and Siena format along with five lenses that work with each camera style. The net result is that the 8 MM Vintage Camera has more effects, more sound options, and automatically ports to camera roll storage with one single step. The only disadvantage is that the film has to be shot while holding the phone horizontally, much like you would shoot any video without an effect application. 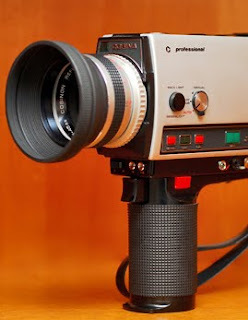 Super 8 inspiration from the 1960s. Of course, the original Super 8 film cameras were released by Kodak in 1965. It was the first time amateur filmmakers could enjoy 50 percent larger film and have the benefit of an easy-to-load plastic light-proof cartridge. The take-up spools were only 50 feet, giving owners about three minutes and 20 seconds of film per cartridge. Typically, most Super 8 films were made with reversal stock, which produces a positive image on a transparent base. This avoided the expense and degradation of image quality using negative film and then copying to a positive. But in 2005, Kodak discontinued the popular stock. Nowadays, anyone attempting to recapture the Super 8 look uses a new ISO 64 Ektachrome. Super 8 Scores A Retro Score Of 9.2 On The Liquid Hip Richter Scale. Sometimes you can still find unused Super 8 movie film on the market, with its super saturation and wide latitude. The few places with Super 8 film left usually charge about $20 per roll. Originally, reels were as little as $5 and could work on $30 cameras. The influence of Super 8 film cannot be underestimated: Ron Howard, Sam Raimi, Francis Ford Coppola, and Martin Scorsese all started with 8MM film. If you have an interest in picking up 8MM film as a hobby, make sure you visit Pro8mm.com for some great tips, techniques, and updates on the art. Otherwise, you can download the Super 8 iPhone App from iTunes for 99 cents. Or try the original 8MM Vintage Camera for only $1.99. You can also find the Sony DCR-SX85 Handycam Camcorder on Amazon. Or, the more rugged Sony Water-Proof LCD DV on Pickegg.com, which also sports a broad selection of specialty video equipment.